You can delete your review at any time by contacting us. "Relaxing Weekend at the Coast Imola and Daniel are very welcoming. Nothing is too much trouble. Room is delightful and breakfast delicious. Imola recommended a very good restaurant nearby and the second day we visited a delightful village nearby also recommended by Imola. Will definitely return. Would highly recommend a visit. And we had sunshine - also arranged by Imola :)"
"It was great! It's Paradise. The Breakfast is very hearty, all homemade and very tasty. The owners do everything themselves. Highly recommend!" 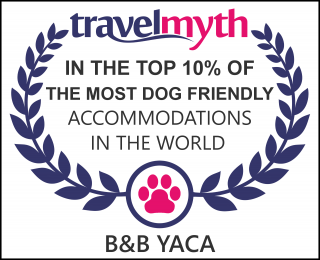 "We had a lovely time at B&B Yaca! Our host Imola met us at the door, immediately helped with our bags and got us settled. She made excellent recommendations for us to see Brugge in a non-touristy way, and was so genuine and sweet to us. The home was perfectly clean and ready for our arrival, our room was cozy and warm right from the start. After checked in, we took Imola’s recommendations and visited the Christmas Market in Brugge. Stunning to experience this amazing place in such a festive way! Imola’s recommendations on where to park, what to avoid, where to eat, and where to find the historic sites were spot-on. The next morning, our breakfast was served right on time, and we were met with a lovely and plentiful breakfast of homemade breads, fruits, jam, artisanal meats and cheeses. The coffee was perfect and the meal was the perfect relaxed start to another day in Brugge. Imola treated us like family, and was so kind and generous in her sharing of local history, the culture and charm of not only Brugge, but of the small town of De Haan. We truly felt at home, and are hopeful about returning to B&B Yaca again on our next trip. Highly recommended!!" "Very comforable stay The room we had is really high quality and comfortable. The owners of the property are extremely helpful and friendly. The location is great - a short ride to the beach and the countryside without being right in the middle of de Haan. So peaceful and quiet with everything you need." " Ewa, (PL) We had a great weekend! Nice place, friendly host & delicious breakfast." "Belguim seaside In a peaceful location. Very welcoming & helpful. Lovely breakfast." "Samuel, (GB) Very friendly and welcoming staff!" "DeHaan on seaside with easy access from A10. Yaca is on a quiet road with a nice big garden,facilities are improving all the time,hosts are as charming and helpful as ever,breakfasts have all you could wish for including home made jams.I have just returned after my 5th stay there-it was the best ever "
"Very friendly and accommodating couldn't do enough for you absolutely fantastic breakfast"
"Many thanks for your kind hospitality.Regards to Daniel and love to Imola"
"Lovely B&B in a quiet neighbourhood, comfy beds, met my expectations. &#61720;The beds were very comfortable. They added an extra bed for my daughter and although the room was very tight, everyone was very comfortable. The hosts were friendly and accommodating. Breakfast was a lovely continental spread. " "Very good breakfast and visiting advise from he owners Amazing hospitality and customers attention "
"Very good hotel, friendly hosts, who try to help to a person who arrived first time in De Haan. A little bit far from the sea, but if you travel by car - it is quite convenient. Quiet location. Very comfortable bed. Excellent breakfast. From the minuses - friends did not have a shower in the room, which located on the floor, but the price of the room from is lower. " "Located in a lovely part of the town. Good breakfast. Extremely helpful hosts. " "Dear Imola and Daniel I'm so sorry, that my e-mail is coming to you so late. I got sick when we got back to Finland (just a common cold) and had no energy for a few weeks to do anything. I can't tell you how much we enjoyed our stay with you in your lovely B&B, it was so wonderful. And I have never seen anybody who loved our Roosa as much as you two did. I know that Roosa loved the two of you also. After we left your place we took the ferry to Denmark and drove over the connecting bridge to Sweden. We stayed at a beach hotel/spa in Sweden and it was terrible. Frank wrote a real bad review about it. The following morning we drove all the way to Stockholm and took the ferry to Turku (slept on the boat with a window view) and the next morning we drove to Helsinki. It is good to be home again after 6 months; however, we really had a wonderful trip and we hope to visit some of the lovely places again soon. I have not forgotten about the Sibelius music; I will send it shortly. Here are some of the photos that I took. All the best our dear friends! Hannele"
"Yaca means "welcome," and the owners certainly live up to that name. This is a very comfortable, clean and quiet place, with an excellent breakfast. It is within 10 minutes' walk of De Haan, and perhaps 20 from the beach. Daniel and Imola know the entire area very well, and are helpful while also remaining discrete. The bed was very comfortable, and the bathroom spacious, with a good shower. I will certainly return, as I come to De Haan often, and I recommend Yaca to anyone looking for quiet and comfort, and at a very good rate, close to the Belgian coast and polders "
"We arrived a day late because of my poor Internet skills. And yet both Imola and Daniel were really happy to greet us. To say they provided a wonderful evening is an understatement. We were treated to one of the most memorable evenings in our entire trip from Altea, Spain to our home base in Espoo, Finland. De Haan itself is a beautifully manicured small town outside of Bruge the unquestionable capital of the northern Renaisance. With this stay, Flanders and Belgium have gone from a big question mark to a highlight in a long car trip." " Dear Daniel & Imola, Thank you for the wonderful photos. Unfortunately, we were on a tight schedule and didn't experience the whole of Bruge. Belgium and De Haan have become special for us. Our overnight stay was wonderful in every sense of the word. Your kindness and care made Hannele, Roosa and myself feel welcome. I have never been so pampered and cared for at anyplace during my travels. We experienced your special culture and got to know the world better in one short evening. We have written a sterling review in Hotels.com (our booking reference) and we hope that you will benefit from our words. I look forward to my next visit to your lovely country and hopefully to De Haan. Warmest regards, Frank Langella PS-Look forward to seeing and reading Daniel's book. "